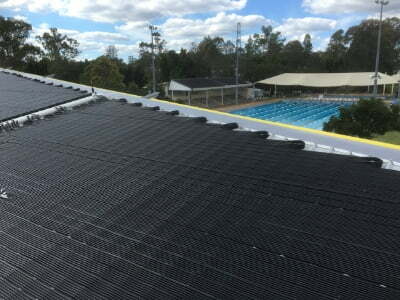 Commercial swim centres, including the AIS, are turning to solar as their primary source of heating. The suns energy is free forever while gas and electricity prices continue to rise! Strip solar collector is the most popular option. It can generate up to 0.5Kwh of energy per sqm when the sun is shining. Sunbather’s commercial grade strip collector comes with an industry leading warranty of 15 years and has a life expectancy of over 20 years. Sunbather offers a free energy audit & ROI calculation using a unique Pool Heating simulation developed by the University of NSW specifically for swimming pools. We can calculate your pool centres current running costs, then apply the savings solar pool heating and/or pool covers will generate showing you the savings in dollars, evaporation (litres), and greenhouse gas tonnes. We are confident you will be surprised with the results. Contact commercial@sunbather.com.au to sign up for this free service. Suntube-2 Rigid Panels are a popular choice for commercial centres needing durability. Performance of the Suntube-2 rigid panel is almost identical to the Sunbather Strip and also comes with a 15 year warranty. 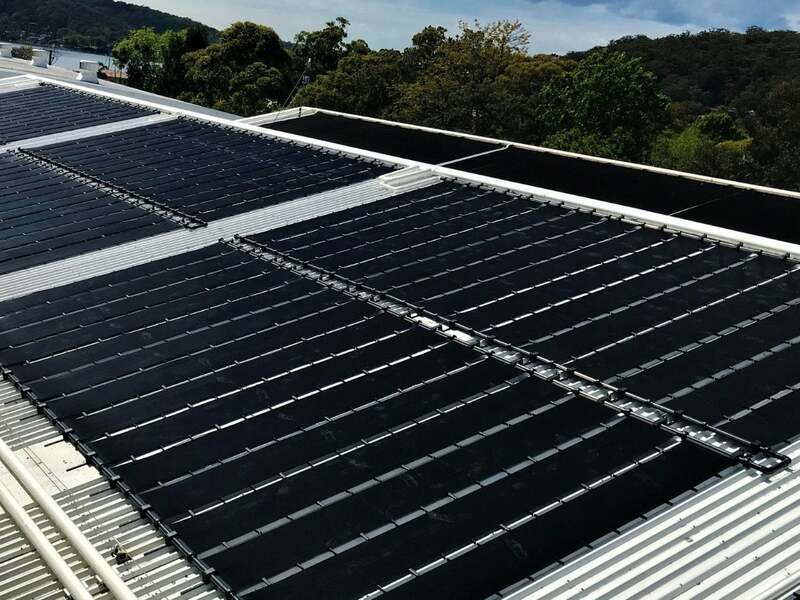 A solar system on a commercial swimming centre should be the primary source of heating. To minimise running costs heat pumps and gas heaters should only be used as a back-up. Not only are they underground, but Sunbather Thermal Pool Covers will halve your gas bills if used overnight and save you thousands on water and chemicals. Sunbather’s 200 Series stainless steel roller has been ultra-reliable over decades of hard usage. Strong 316 stainless construction, heavy duty wheels, and options for starter block extensions give the 200 roller flexibility to suit any pool. The 200 is designed to be mobile for easy and convenient storage. For larger covers, it can also be automated using the Sunbather SuperSlave motor drive. Wall mounted rollers are fast becoming the most popular option for commercial centres. Ideal where ground space and access is limited. When staff requires the easiest & quickest option, a remote control roller system is the only solution. Simply push the remote and guide the covers on and off the pool with minimal effort. The pre-set limit switches ensure the roller stops in precisely the correct location every time. Watch Remote Pool Covers in Action! Sunbather Underseat Rollers can be located on the ground or hung off the wall. The perfect choice when space is limited. 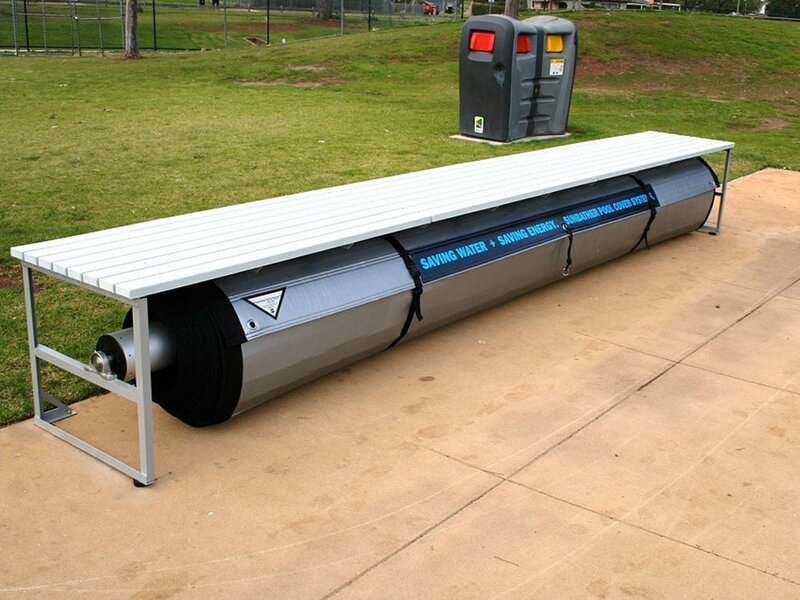 Sunbather designs, manufactures, and installs the roller and cover AND the seat for a full turnkey solution. Underseat rollers offer dual purpose usage at a budget friendly price. They can also be automated using the Sunbather SuperSlave. Watch Underseat Covers in Action! Speed and OH&S are now key operating factors. SuperSlave provides fast and safe pool cover operation, so most large pools now use it. Simply plug it into the side of the roller, push the button, and let the Slave do the work for you. Very manoeuvrable and quick to recharge, the SuperSlave makes pool cover operation a one person job. Watch the SuperSlave in Action! Most large commercial centres will require a back-up heater for the solar system to ensure year round consistent temperatures. In warmer climates Heat Pumps are a popular and reliable secondary heat source to solar. They help sustain temperatures while solar keeps running costs to a minimum. Sunbather is a preferred national supplier of the renowned Rheem Accent Heat Pumps, providing a robust product for any size swimming pool. As a 40 year old national company, Sunbather only partners with reputable national brands. For commercial swimming pool gas heaters, Sunbather is a preferred supplier of Raypak and Rheem products. Sunbather are able to audit your pool heating costs, accurately size the correct heater, and install providing a full turnkey solution. To minimise running costs heat pumps and gas heaters should only be used as a back-up to a solar system with pool covers.